Dawn reports on yet another mountain trip, this time to the Appalachians. As my post about attending Thinking Mountains 2018 in Banff, Canada, may have suggested, one of the real advantages of studying mountains is getting to visit them. A few months ago, our mountains project was privileged to be invited to participate in the International Mountain Studies Symposium hosted by Appalachian State University. I pulled the short straw (!) of representing the team and travelling to the beautiful mountains of North Carolina. I was asked to give a keynote, so decided to go for a somewhat ambitious title to justify my position in the programme, speaking on A Mountains Manifesto? Toward the Historical Mountain Humanities. My proposal – riffing somewhat off Jo Guldi and David Armitage’s History Manifesto – was that a collaborative, longue dureé history of mountains had the potential to highlight far more diversity of experiences, and offer far more to contemporary debates, than the long-established sense that European appreciation of mountains only began a few hundred years ago. This received a warm hearing in a room of Appalachian scholars: somewhat akin to premodern mountain history, the mountain experiences and engagements of the Appalachian region have frequently been overlooked and stereotyped. The symposium itself was a rich demonstration of the diversity of mountain studies in Appalachia: with parallel sessions representing around 80 speakers I was barely able to scratch the surface of topics on offer, but was variously moved, fascinated, and enlightened by the panels I did attend. This single day of learning and discussion would have made the trip worth making on its own, but Appalachia had more in store for me. The mastermind of the symposium, Katherine Ledford, had planned a series of field trips for the half dozen or so international guests of the event. The day after the symposium, we duly tumbled into a sturdy white minivan (‘borrowed from Geography’), and were treated to a whirlwind tour of North Carolina’s places and people. We headed up to the Swinging Bridge (which does not, alas, swing any more) on Grandfather Mountain, and learnt about the amazing work of the High Country Food Hub, Boone, which makes it easy for shoppers to buy local food from small farmers, and Appalachian Voices, which campaigns against mountaintop removal coal-mining. We visited the Appalachian Trail on Roan Mountain, where Katherine apologised for the wind and fog (which I felt was unecessary as it made me feel right at home – are you meant to see a view from a mountain? ), and looked around the incredible Penland School of Crafts. Finally, we were treated to an evening of ‘oldtime’ music and a potluck supper at Bakersville Baptist Church – I’ve never seen a more generously-laden row of tables. This may all seem quite a long way from the premodern history of mountains, but the aim of all this was to highlight the diversity of lived experiences of Appalachia, and to get beyond a university boardroom and into real communities. I found this incredibly thought-provoking. I was struck by how central the mountains were to the way people defined their daily lives: so many people I spoke to referred to themselves as ‘mountaineers’, not in the climbing sense but in the living-on-the-mountain sense, spoke of their music as ‘mountain music’, and took pride in offering warm mountain hospitality. Just like my premodern ‘mountaineers’, their relationship to the mountains was quite separate to the practices of climbing and heroic conquest which are paradigmatic of the modern engagement with the ‘wild’ landscape. Illustrations: View from the Blue Ridge Mountain Parkway, and on Grandfather Mountain. Augustus Hare liked looking at Mt Soracte. Hare was born in 1834. He made a career out of writing biographies, an autobiography, and a string of guide books. He was renowned as a raconteur of ghost stories. His works were very popular (his biography of his godmother, who adopted him and brought him up, ran into eighteen editions), but it is not always easy for modern readers to see why: his biographical and autobiographical writing offers gentle but unspectacular portrayals of upper-middle-class English life in the country (they were criticised even by some contemporary reviewers for their prolixity), and his guide books feel formulaic by comparison with the more unpredictable thrill of exploring Greece and Italy with some of the earlier eighteenth- and nineteenth-century travel writers like Edward Dodwell. The difference is that Hare was writing for a growing culture of tourism, for readers who wanted practical information as well as scholarly detail and personal response. Within that context he broke new ground. In his Days Near Rome (published in two volumes in 1875) he urges his readers to go beyond the standard excursions and recounts his own travels to less frequented sites, full of colourful details about the local peasant populations unused to tourists, and practical travel advice on the practicalities and price of carriage and donkey hire, hotel rooms and train tickets. Mt Soracte was one of those sites. Soracte stands about 30 miles north of Rome. It’s not a high mountain: only 691 metres—and not a long walk to the summit from the village of Sant-Oreste on its slopes. It is a spectacular place, and it is visible from a long way off: it stands up from the plane like a giant fin—there are no other hills anywhere near it. But that in itself doesn’t explain the power it had over the imagination of classically educated northern European travellers like Hare. The crucial factor was the famous Soracte ode by Horace, written in the late first century BCE, which was one of the best known and most loved of all Latin poems in Hare’s day; any classically educated person would have been familiar with it. The famous initial image is of the mountain covered in snow, followed by a description of drinking wine in front of a warm fire, and then a set of reflections on youth, old age and love: ‘You see how Soracte stands white with deep snow (vides ut alta stet nive candidum Soracte), and the labouring woods can no longer hold the weight, and the rivers have stopped from the sharp cold’ (Horace, Odes 1.9.1-4). After those four brief lines, the mountain fades from view: Soracte is not mentioned again in the poem. It seems extraordinary that such a brief glimpse could have haunted the imagination of centuries of later readers. It was the opening line of this poem that Patrick Leigh Fermor’s German captive, General Kreipe, quoted to him in looking at the sunrise on Mt Ida in Crete in 1944; Leigh Fermor claims to have quoted the rest of the poem to him from memory in response, an incident which united the two men temporarily in their shared mastery of the classical heritage. Hare’s descriptions of Mt Soracte are concentrated in his account of an excursion to the summit on 1 May 1874, but they are also spread out right through the text on either side of that section, and into his other works too. Travelling from the train station at Montorso to Farfa, he tells us that ‘we at once began to reach a new country, rich in vines and figs and olives, and with lovely views towards the noble, serrated outline of Soracte’. At the gorge of Civita Castellana, he tells us that ‘each turn is a picture more beautiful than the last, and ever and again beyond the rocky avenues, Soracte, steeped in violet shadows, appears rising out of the tender green of the plain’. On the day of the Soracte excursion, we hear that ‘no drive can be uninteresting with such an object as Soracte before one, ever becoming more defined’. Looking back on a later trip he sees ‘Volscian, Hernican, Sabine, and Alban hills, Soracte–nobly beautiful–rising out of the soft, quiet lines of the Campagna’, and then later in the day at Caprarola he admires the ‘whole glorious rainbow-tinted view, in which, as everywhere we have been, lion-like Soracte, couching over the plain, is the most conspicuous feature’. He even returns to Soracte in his mind’s eye later in his life. In his autobiography, The Story of My Life, he talks about a trip to Snowdon: ‘From Llanberis I ascended Snowdon, which in my recollection is—from its innate picturesqueness, not its views—the only mountain in Europe worth ascending, except Soracte’. For Hare’s contemporaries, too, Soracte seems to have been special. A review of Days in Rome in the Spectator in 1875 singles out Hare’s account of Soracte for lengthy quotation (‘an eminence which to all readers of Horace holds a place of conspicuousness in their memories similar to that which the elevation itself possesses in relation to the Campagna’). Hare not only describes Soracte himself repeatedly; he also quotes over and over again from others who have done the same: in Days in Rome and the equivalent volume for excursions within the city, Walks in Rome (1871), he quotes at length from twelve different nineteenth-century authors (including novelists like Amelia Edwards, Nathaniel Hawthorne and Charlotte Dempster, as well as travel writers and scholars) who had previously described the mountain. The most telling of those is a famous passage from Byron’s Childe Harold. He too picks out the modestly sized Mt Soracte as an important place in his imaginary geography. And on the crest hangs pausing. Byron is here giving his impression of the Apennines, which in his view cannot match the grandeur of the Alps and of the mountains of Greece. Only Soracte can hold its own in that company. The relationship these writers had with Horace isn’t always straightforwardly positive. Hare’s own account has a very un-Horatian quality in its emphasis on personal experience of climbing the mountain, and in his quotation of a huge range of other classical sources on the mountain in addition to Horace. That’s all the more the case for Byron, who uses an image of the mountain in explain his own inability to overcome the loathing for Horace’s poetry that he felt in the austere lessons of school days, even though he now understands intellectually the value of Horace’s poetry: ‘Then farewell Horace, whom I hated so…Yet fare thee well; upon Soracte’s ridge we part’. But even in that negative judgement we can feel the remarkable attraction of Mt Soracte. Hare’s fascination with it, and the fascination of his contemporaries, is a good example of the dominance of the classical tradition, for nineteenth-century travellers, over their real-life encounters with the Italian landscape. Illustration: Monte Soratte visto da Civita Castellana by Croberto68, CC BY-SA 3.0. Dawn reports on a project trip to an international mountain studies conference in the snow-covered mountains of Banff National Park, Canada: it’s a hard life being a mountain historian. Just last week, the mountains in ancient literature and culture project team had the pleasure and privilege of attending Thinking Mountains 2018, a four-day interdisciplinary summit in mountain studies. Of course, such an event couldn’t happen just anywhere: it was based at the Banff Centre for Arts and Creativity, right in the midst of the Canadian Rockies. The conference opened with what the organisers swiftly termed ‘the snowpocalypse’, with 40cm of unseasonal October snowfall settling in the course of just a few hours. This made for a particularly eventful journey for Jason, whose bus from Calgary airport perfectly coincided with 7-hour long delays on the Trans-Canada Highway. (I had travelled in the day before, and felt ever so slightly guilty as I enjoyed the Banff Upper Hot Springs watching the troublesome snow come down). Thinking Mountains is one of the many excellent results of the Mountain Research & Initiatives centre at the University of Alberta. Among other things, they also run a MOOC (massive open online course) titled ‘Mountains 101’, offering a 12-week overview covering everything from the geological development of mountains to their modern-day cultural impact. The 2018 meeting marked the third instance of Thinking Mountains: I attended the second summit, in 2015, mid-way through my doctorate, and to say it changed the course of my PhD would not be an understatement. Why? Because it offered me the first chance to stop trying to explain to historians of other subjects why mountains mattered, and instead to get feedback from an audience full of people studying mountains on why (or if) my particular historical perspective on them mattered. (In terms of memorability, it also helped that the 2015 meeting was in Jasper, another beautiful spot in the Rockies, and featured my first ever experience of walking on a glacier). During my interview for the postdoctoral fellowship with the mountains project here in Classics at St Andrews, I flagged Thinking Mountains 2018 as something I specifically wanted to do if I were to get the position: I wondered from the outset what the anthropologists, sports scientists, and mountaineering historians I had met in 2015 would make of classical mountains. We were fortunate enough to be allocated a full panel session just to our project, enabling us to spend 45 minutes going into the details of our project and sharing a few case studies, and then giving over the final 45 minutes to general discussion and feedback. This was led by our three ’roundtable’ members, Carolin Roeder, who works on modern Alpinism from a transnational perspective, Dan Hooley, who works on classics and classical reception, and Sean Ireton, who is currently co-editing (with Caroline Schaumann) a frankly excellently-titled book, Mountains and the German Mind: Translations from Gessner to Messner, 1541-2009. Their very astute comments were followed up by challenging questions and ideas from the wider audience. We left our session with a lot to think about. Just as thought-provoking, however, was the rest of the conference, from the formal academic papers to the more laid-back evening events (this included an ‘evening of story and song’ with Sid Marty, an ex-park warden with plenty of eye-raising tales to tell about bears). When Thinking Mountains calls itself an ‘interdisciplinary’ summit, that isn’t just lip-service to the latest buzzword: it is what, at least from my perspective, the event is all about. ‘Mountains’, after all, can be studied from the point of view of geology, conservation, sport, film, history – and classics. Throughout the conference, different disciplines were challenged to think about how they ought to relate to each other within the field of mountain studies. We found ourselves challenged by the question of where our project fits in: which other disciplines should it be speaking to and, equally importantly, where do we draw the line in the sand regarding our own disciplinary distinctiveness? What is it about this project which gives it cross-disciplinary potential, and what is it about the approach of an early modernist and a classicist that gives it something unique? Questions did not just swirl around the issue of disciplinary definition: both in our panel, and in several other papers which we attended, challenges were launched against terms such as ‘mountain literature’, ‘mountaineer’ and ‘mountaineering’. The latter two terms (and, frequently, the first as well) are all too often equated with the modern sport of mountaineering, and amidst debates about commercially-led expeditions the definition of ‘real’ mountaineering is constrained into ever narrower boundaries. If we expand these definitions – perhaps with a reversion to the pre-modern usage of referring to anyone dwelling on a mountain as a ‘mountaineer’ – would this make different stories, both present and past, more visible? Or, as one fellow mountain-thinker suggested, are these questions of definition really the most useful ones we can be asking? We hope to explore some of these questions in more depth – and other thoughts and ideas inspired by our week of Thinking Mountains! – in blog posts over the coming weeks and months. Oh, and, of course – we climbed a (very small) mountain whilst we were there. Illustrations: The view looking west from the Banff Centre, and on top of Tunnel Mountain (also known as Sacred Buffalo Guardian Mountain). Not as unconnected as you might think: Jason traces some initial connections between classical literature and imagery and the mountains of Scotland. I have been trying to work out recently in some spare moments how far travellers’ accounts from Scotland from the eighteenth and nineteenth centuries are influenced by the classical tradition in their portrayal of mountains (and in that sense this post follows on from my previous one on Edward Dodwell and travel writing in Greece). On the face of it the answer is ‘not very’. Samuel Johnson was famously unimpressed by the mountainous terrain of the Highlands during his visit in 1773. There are very few classical resonances in his descriptions of the landscape he travels through. For Johnson the point of the Homeric quotations is their comical inappropriateness, not just in the point about treelessness, but also it also in the initial reference to abundance of springs: presumably we are meant to suspect that watery nature of Scottish mountains fall far short of the beauty and fertility of Mt Ida as it is envisaged in that Homeric epithet. (Johnson notoriously exaggerated the treelessness of Scotland in his description of St Andrews too: ‘from the bank of the Tweed to St Andrews I had never seen a single tree… At St Andrews Mr Boswell found only one, and recommended it to my notice’ (15-16); Boswell in his later version refers to the fact that Johnson’s account had been ‘violently abused’ on publication for that assertion and feels the need to defend his companion from criticism: ‘when Dr Johnson talks of trees, he means trees of good size’ (The Journal of a Tour to the Hebrides (1785) 67). Byron is another interesting case. Unlike most of his fellow travellers in Greece in the first few decades of the nineteenth century, Byron was quite ambivalent about the antiquarian exercise of identifying classical sites and in some respects he seems to find the landscape of Albania exhilarating precisely because it is less encumbered by classical associations. Stephen Cheake talks about that phenomenon in his 2003 book Byron and Place, and about the way in which Byron represents Albania as ‘untrodden ground’ (Cheake p. 30). He also talks about the way in which Scotland is linked with Albania in Byron’s writing, and the way in which it stands in contrast with Greece in some respects (Cheake pp. 36-7). One might therefore take the lack of classical reference points in Johnson’s account as typical, just as some have taken his lack of enthusiasm for Scottish mountain scenery as typical of pre-Romantic scorn for mountains more general. If we look a bit more closely, however, it becomes clear that that is an oversimplification: there are many examples of artists and tourists taking an interest in both Greek and Scottish landscape and even seeing the two as connected with each other. The work of H.W. Williams is a case in point. He was born in 1773. He visited Greece and Italy, returning in 1818, and was famous for his drawings of Greek landscape, especially in his publication Select Views in Greece a decade later, which earned him the nickname ‘Grecian Williams’. But he also published scenes of Scottish landscape which at least as far as I can see echo the style of his Greek images closely. For a classically inclined example of late eighteenth-century travel-writing from Scotland one might look at the work of William Gilpin, especially his 1789 publication Observations, relative chiefly to Picturesque Beauty, made in the Year 1776, on several Parts of Great Britain, particularly the High-Lands of Scotland. Gilpin travelled the year after Johnson’s account was published. He was one of several writers who were intrigued by Johnson’s negative representation of the Scottish landscape and went in part to see whether they agreed. His experience was clearly rather different: he shares some of Johnson’s negativity, but he also sees the Scottish landscape as having ‘a peculiar power and poetry of its own’, as Malcolm Andrews puts it in volume 1 of his sourcebook, The Picturesque (1994) (p. 385). And it is striking that Gilpin includes fairly regular classical quotations, especially from Virgil. mountains covered with fir, which when fully grown, and their uniformity a little destroyed by the axe, may hereafter have a fine effect. The quotation here is from Virgil, Aeneid 11.320: ‘Let all this tract, with a pine-clad belt of mountain height, pass to the Trojans in friendship’. The Latin king Latinus is here proposing that a tract of land be offered to the Trojans; it is characterised as rough land that is difficult to work, but also associated positively with the beginnings of the city of Rome. This quotation is from Aeneid 12.523-4: ‘as when in swift descent from mountain heights foaming rivers roar and race seaward, each leaving its own path waste: with no less fury the two, Aeneas and Turnus, sweep through the battle’. Here the image has destructive and intimidating connotations, but it is also linked with the grandeur and high status of the two great warriors of the poem. There are many other examples: over and over again Gilpin reaches for classical reference-points (as well as frequent quotations from English poetry) to make sense of the forbidding but impressive landscape he encounters. Illustrations: Plain of Orchomenos from Livadia, engraving by William Miller after H.W. Williams, 1829; Edinburgh from Arthur’s Seat, engraving by William Miller after H.W. Williams, 1826. As mentioned in a recent blog post, one of the big events of the summer for our mountains project was the ‘Celtic Conference in Classics’, taking place at St Andrews in July, and for which we hosted a panel on ‘approaching landscape in the classical tradition’. As anticipated, the three-day panel proved to be an immensely rewarding and thought-provoking opportunity to discuss issues of landscape and methodology from a wide variety of angles and with reference to a range of different sources, periods, and localities. Our intention, ever since we conceived of the panel, was to produce a report which would serve both as a record of the ideas and issues raised but also as a starting-point for further work and discussion in classical landscape studies. We are extremely pleased to now be able to distribute that report, which brings out the key themes – memory and time, social consensus, imagination, embodiment – connecting the twenty diverse papers which formed the panel. The report also incorporates a brief bibliography provided by each speaker, identifying a select series of theoretical works which informed the development of their ideas. We hope that this bibliography will form a valuable resource to any scholar or student wishing to develop their own methods for ‘approaching landscape’. We very much hope that readers with an interest in classics, landscape, and methodology will find the report both interesting and useful! We would like to take this opportunity to extend our thanks to Chloe Bray for so ably capturing the panel, and to all of our participants for making it such a rewarding experience. Dawn considers the surprising story of a twentieth-century elephant and Hannibal’s crossing of the Alps. I am currently beginning to make the first cautious steps into a new area of research. During my PhD, which focussed on sixteenth- and seventeenth- century responses to mountains, I trawled through the first thirty or so volumes of the Alpine Journal in search of references by modern mountaineers to early modern (c.1500-1750) mountain engagements. Along the way, I noticed a considerable number of references not only to early modern accounts of mountain endeavour, but also to classical ones. With my copies of the Alpine Journal now sitting happily alongside various Loebs, it occurs to me that it may well be time for me to revisit the ways that mountaineers from the mid-nineteenth century onwards thought and wrote about classical mountain engagements. What else did they think that the Alps were but high mountains? They might fancy them higher than the ranges of the Pyrenees; but surely no lands touched the skies or were impassable to man. (History of Rome 21: 30.7-8). The journey that followed, as described by Polybius and Livy, was trying in the extreme, with the army fending off attacks from local tribesmen, and facing a narrow, snow-choked pass at the high point of their route. Although Hannibal was ultimately defeated, his crossing has gone down in history as a remarkable military – and mountaineering – achievement. The solution to this was none other than to acquire an eleven-year old female Indian elephant named Jumbo, to train her, and to take her on a trans-alpine march along the supposed route of Hannibal’s pass. Although they stopped five miles before the pass, wary – as, they argued, Hannibal might not have been – to take undue risks with their elephant, her performance gave ‘no reason to doubt’ that the theorised route ‘would be quite consistent with the climbing capabilities of Hannibal’s elephants’. The expedition also resulted in several book-length publications, including the groan-inducing pun of a title by John Hoyte, the expedition leader, of Trunk Road for Hannibal (1960). An account of the expedition, along with photographs including one of Jumbo, charmingly, dressed in ‘boots’ and ‘jumper’, can be found on Hoyte’s website. In some respects, this episode could be cited as an early and ambitious example of experimental archaeology. It could also be shrugged off with a smile as a fairly amusing, impressive, but not particularly meaningful incident, representative of the lengths to which scholar-mountaineers might go to prove their pet theories. However, I think it is also representative of a long-standing and fascinating theme within nineteenth- and twentieth-century mountaineering discourse: of mountaineers, for all their modernity, enthusiastically engaging with the classical past. Precisely what other forms that engagement took – in addition to taking an elephant named Jumbo 7,000 feet up a mountain – is what I hope to spend the next few months finding out. Douglas W. Freshfield, ‘The Pass of Hannibal’, The Alpine Journal Vol.XI, No. 81, 267-300. Sir Gavin de Beer, Alps and Elephant’s: Hannibal’s March (London, Geoffrey Bles, 1955). A. Richard Jolly, ‘Hannibal’s Pass: Results of an Empirical Test’, The Alpine Journal Vol.LXVII, 243-249. Illustrations: John Leech, ‘Hannibal Crossing the Alps’ from The Comic History of Rome (c.1850); the Col de Clapier, by Edward Boenig, CC BY-SA 2.5. At the time of writing, it is now less than a week until the 11th Celtic Conference in Classics opens in St Andrews. The ‘CCC’ – which has been running at a different institution each year since 1998 – will feature fourteen distinct panels on different topics within classical scholarship. We are extremely excited to be hosting one such panel, on ‘Approaching Landscapes in the Classical Tradition’. Our call for papers, distributed at the start of the year, resulted in an enthusiastic wave of abstracts from a wide range of perspectives, and our panel will feature contributions from twenty scholars from across both the discipline of classical landscape studies and the world. The remit we have given our speakers is to come prepared to share their own methodological and theoretical toolkits for ‘approaching landscape’ in past contexts. What do we mean by this? As suggested by one of the earliest posts on this blog, asking ‘What is a mountain?’, the study of landscape is by no means straightforward. A mountain is more than a geomorphological feature: it is also defined and constructed by human cultures, communities, and individuals. The complexity of ‘landscape’, and of human interactions with it, has long been recognised and tackled in disciplines such as geography, anthropology, and sociology. What we hope is that our panel next week will help to bring together some of the methods and theories particularly appropriate for understanding landscape interactions and depictions in the classical past. How do different scholars within classics define ‘landscape’ (or mountains, or rivers, or forests) within their research? Are there particular theories utilised in other disciplines which might help us to understand landscape better? Glancing at our schedule, it seems pretty evident that over the course of the CCC a multitude of theories will be brought to bear on a multitude of landscapes. We will be hearing about jungles, trees, rivers, mountains, volcanoes, gardens, caves, and how they relate to concepts such as Foucault’s heterotopia, ecocriticism, liminality, reception. After the conference, we will be distributing a report which we hope will serve as a working guide to the different methodologies proposed, and the potential they might offer to future research on landscape. Jason considers the merging of modern categories of the sublime and the picturesque with an appreciation of the classical past in the works and writings of Edward Dodwell (1767-1832). A lot of my work on the project recently has been on ancient texts and contexts. One of the goals of that work is to recapture something of the sophistication of Greek and Roman engagement with mountains, as a way of challenging deep-rooted assumptions about the lack of interest in mountains before the mid 18th century. Travellers’ accounts from Greece and Italy from that period are a particularly interesting place to look. Many of them draw heavily on the aesthetic vocabulary that was so popular in the late eighteenth and early nineteenth centuries. Greece in particular was an important focus for the development of thinking about landscape: the Napoleonic wars had made the traditional Grand Tour destinations of western Europe inaccessible in the early 1800s, and attention turned more and more to Greece and western Turkey. At the same time many of these authors were steeped in ancient literature, especially authors like Strabo and Pausanias. One of my favourite examples is Edward Dodwell. Dodwell’s journeys through Greece took place in the first decade of the nineteenth century, but he waited until 1819 to publish them, with the title Classical and Topographical Tour through Greece during the years 1801, 1805, and 1806. Dodwell was an artist (his work was heavily dependent on the use of a camera obscura). Many of his paintings from those trips involve views of mountains or views from mountain summits. One of the striking things about his descriptions of landscape is that they often combine aesthetic judgements—including the language of the beautiful, the picturesque, the sublime—with a celebration of the classical heritage, as if the two are inextricably linked in his mind. On a hill near Missolonghi in north-west Greece, for example, he says that ‘we were deeply impressed by the view which it displayed. The features are truly beautiful; and the objects are rich in classical interest’. At Thermopylae ‘the beauty of the scenery was illuminated by many reflections from the lustre of the classic page’. Of Mt Ithome he says that ‘few places in Greece combine a more beautiful, and at the same time a more classical view’. a deep silence prevailed throughout the cells; the occupants of which seemed to have recently retired. The store-rooms were open, and well furnished with jars of Hymettian honey, ranged in neat order: next were large tubs of olives; and from the roof hung rows of grapes, pomegranates, and figs. The only inhabitants left in the convent were some cats, who seemed to welcome us in the absence of their masters. We took complete possession of the place, and feasted on the produce of the deserted mansion, which seemed to have been prepared for our reception. I had already seen in Greece many surprising views of coasts and islands, and long chains of mountains rising one above another, and receding in uncertain lines, as far as the eye could reach: but no view can equal that from Hymettos, in rich magnificence, or in attractive charms. The spectator is sufficiently elevated to command the whole surrounding country, and at the same time not too much so for the full impression of picturesque variety; and I conceive, that few spots in the world combine so much interest of a classic kind, with so much harmony of outline. As so often, aesthetic, painterly judgement (the ‘attractive charms’, the ‘picturesque variety’, the ‘harmony of outline’) is combined with antiquarianism. Even by Dodwell’s normal standards the catalogue of what can be seen from the summit is extraordinarily detailed, stretching for six whole pages. The pages preceding the arrival at the summit include extensive references to Ovid, Pliny the Elder, Pausanias and Plato. Up here they seem to be alone with the classical. The jars of Hymettian honey, which Hymettos had been famous for even in the ancient world, and which wait for them in such abundance in the monastery, seem to signal the fact that the the mountain is welcoming them into a place where antiquity is still alive in the present. They pass several more days drawing on the summit, and sleeping in the monastery, and then they go back down to Athens. Hymettos is remarkable for its purple tint, at a certain distance; particularly from Athens, about an hour before sun-set, when the purple is so strong, that an exact representation of it in a drawing, coloured from nature, has the appearance of exaggeration. The other Athenian mountains do not assume the same colour at any time of the day. Pentelikon, which is more distant, and covered with wood, is of a deep blue. Parnes, Korydallos, and the others, are variegated, but generally parched and yellow. It seems clear, that in speaking of the colles of Hymettos, Ovid had in view the number of round insulated hills at the foot of the mountain; which are particularly remarkable and numerous near Sirgiani. That attention to colour and to shape ascribes to Ovid an artistic sensibility like Dodwell’s own. And the phrase ‘had in view’ asks us to imagine Ovid standing there for himself, as Dodwell himself clearly has, gazing down at the vista beneath him. For Dodwell, in other words, his own very modern aesthetic sense is presented as something parallel with what he finds in classical sources, rather than as something separate and different and new. Illustrations: Edward Dodwell, ‘Mount Olympos, as seen between Larissa and Baba’, from Views in Greece (London: 1821), p. 99, and Dodwell, ‘Parnassus’, Views in Greece, p. 19. Dawn explores some early modern images of the classical story of Atlas’ mountainous metamorphosis. I’m currently working on a book proposal (on, you’ll be surprised to hear, mountains in early modernity…), which includes the optimistic selection of the images which, in a world free from printing expenses and copyright concerns, I would ideally see illustrating the finished book. This has meant revisiting a chunky PDF file which I put together several years ago, collecting every image I could find dating from the sixteenth, seventeenth, and eighteenth centuries and which responded to the keyword ‘mountain’. This entirely non-exhaustive search produced some 300+ images, with mountains depicted in illuminated manuscripts, in oil paintings, on tapestries, and in printed woodcuts or engravings: the artists of the early modern period, regardless of media, certainly did not ignore mountains as an important visual element of the environment and as objects rich in symbolic potential. Mountains also appear in a range of different visual roles, for lack of a better word: in some images, they dominate, whilst in others they offer a background of greater or lesser prominence. Certain patterns are also apparent: strikingly, mountains frequently feature in the backdrop of paintings of the Virgin and Child. In one of my personal favourites, Marco d’Oggiono’s Virgin and Child Enthroned with Saints (c.1524), a more naturalistic backdrop of blue, distant hills is overwhelmed by a stylised, craggy peak in the middle distances, which frames and even seems to ‘throne’ the holy pair. The religious significance of mountains is an important theme in my research, and their ubiquity in devotional images is an issue I hope to explore further in the future. Atlas, huge and vast, becomes a mountain—His great beard and hair are forests, and his shoulders and his hands mountainous ridges, and his head the top of a high peak;—his bones are changed to rocks. Augmented on all sides, enormous height attains his growth; for so ordained it, ye, O mighty Gods! who now the heavens’ expanse unnumbered stars, on him command to rest. (Metamorphoses 4.651, Brookes More). This moment marked the legendary origins of the rugged Atlas Mountains, a range stretching some 2,500km through the modern-day Algeria, Morocco, and Tunisia. ‘Picture books’ were as popular in the sixteenth and seventeenth centuries as they are today, and one of the most-frequently illustrated of all the classical texts was Ovid’s Metamorphoses. (Images from and discussions of various such editions can be explored, with a little patience for somewhat historic websites, at Ovid Illustrated and The Ovid Project: Metamorphising the Metamorphoses). As decades of illustrations progressed, Atlas became progressively more giant and his mountain transformation more mountainous: a 1557 edition published in Lyon and engraved by Bernard Salomon, sees Atlas transformed into merely a relatively large crag; a 1591 Antwerp edition from the Plantin workshop shows a hillock with the shadow of the shape of a man, and a head sprouting tree branches. By 1606, the Atlas entry into a series of engravings by Antonio Tempesta offers a greater sense of scale: a crowned Atlas is caught in an expression of horror, his arms and head still flesh but his robes already transformed into a starkly-planed mountainside. This Atlas seems vast, set amidst a wider, mountainous landscape of which he represents the heights, but Perseus (astride Pegasus) seems enormous too. My favourite Atlas print, by Johann Wilhelm Baur (c.1639), shows a far more dwarfed Perseus, standing at the foot of a hill into which an exasperated-looking Atlas appears to be sinking, the lines of his flowing hair giving way to the etched lines of the upper slopes of the mountain, and his right foot already vanishing into the contours of the mountain’s base. This particular image of Atlas proved to be an enduring one: Baur’s design was re-engraved by Abraham Aubry (died c.1684), and the subsequent plates were re-used as late as 1703. I must admit I’m not yet sure what to ‘do with’ these images in terms of drawing any great conclusions regarding the visualisation of mountains in early modernity. I certainly don’t want to fall into any simplistic or stereotyped discussion of the increasing ‘realism’ of mountain depictions as the centuries passed (not least because ‘realism’ seems somewhat ironic when considering an image of a giant turned into a mountain by the head of a gorgon). What I find fascinating about all of the images, however, is the choices made by the artists, within the constraints of their media, about how to depict this compelling moment of transformation, of the disturbing overlap of man with mountain. Do you have branches growing from Atlas’ beard, or the ripples of fabric harshening to sharp cliff-edges? Does Atlas’ form become that of the mountain, or does the mountain absorb his form? 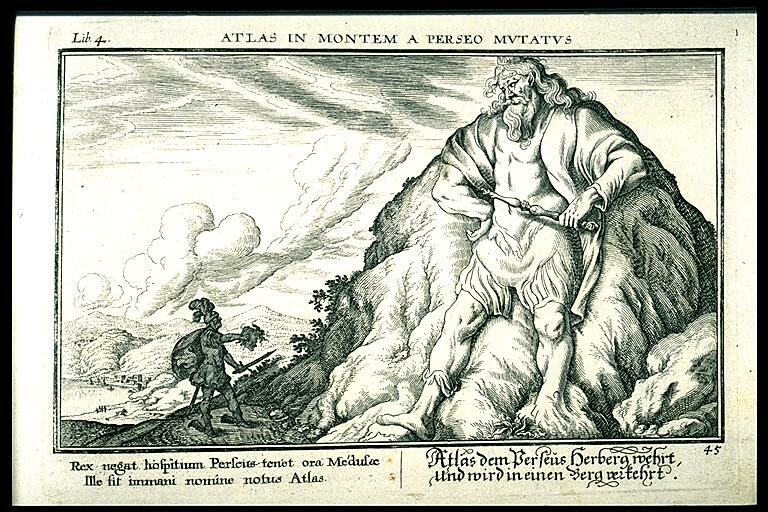 Although Atlas’ transformation into a mountain marked just one of many metamorphic illustrations, and should be read within the wider context of the early modern fascination with Ovid, I also think it is emblematic of an important element of early modern thinking around mountains: namely, the extent to which they could either be anthropomorphised, or interpreted as analogous in their form and function to parts of the human body. However, the surprisingly talkative mountains of Michael Drayton’s Poly-Olbion (1612-22), or the peculiar seventeenth-century obsession with comparing mountains to (multiple, intimate) elements of the human physiognomy, must remain stories for future blog posts. 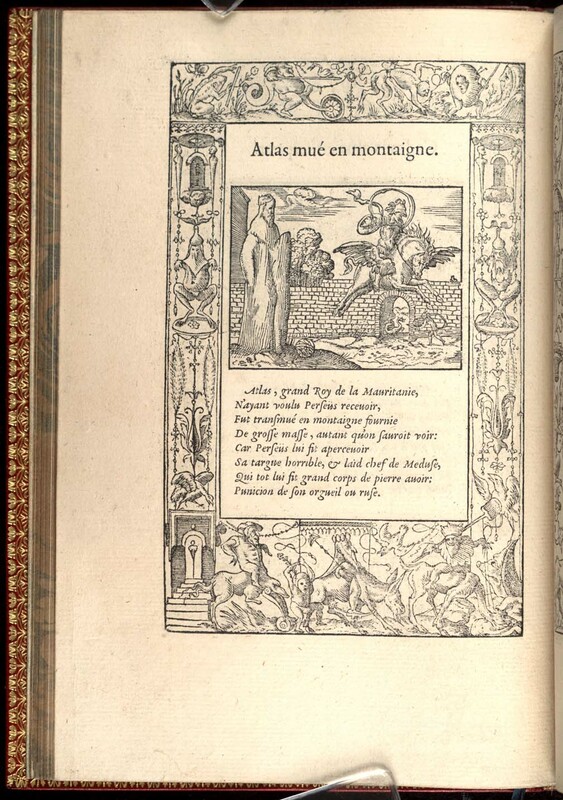 Illustrations: Marco d’Oggiono, Virgin and Child Enthroned With Saint, c.1524, Museo Diocesano in Milan, Wikimedia Commons; Tola Akindipe, Atlas mountain range, CC BY-SA 4.0; Bernard Salomon, Atlas turned into a mountain, 1557, Ovid Illustrated; unknown, Atlas in the mountain of his name, 1591, Ovid Illustrated; Antonio Tempesta, Atlas Turned Into a Mountain, 1606, LACMA collections; and Johann Wilhelm Bauer, Atlas Is Turned into a Mountain by the Sight of Medusa’s Head, c. 1639, Harvard Art Collections. Jason highlights the connection between ancient traditions of military mountain activity and twentieth-century mountaineering. Greek and Roman history writing is packed with descriptions of military activity in the mountains: it’s probably the category of mountain description that survives in the biggest volume from the ancient Mediterranean world, especially from the Roman empire. In classical Greece the dominance of heavily armed hoplite warfare meant that fighting usually took place on the plains, but for later centuries, especially for Rome’s combat against foreign enemies on the edges of their expanding empire, there are countless accounts of mountain combat. It is tempting at first sight to think that these accounts have very little to do with modern traditions of writing about mountains, which we tend to assume are dominated by aesthetic responses and by the association between mountains and leisure. But actually when you look more closely it becomes clear that a large proportion of modern mountain writing, especially in the 20th century, has a heavily military character which is very much in the ancient tradition of writing about mountain conquest. That goes especially for the major Himalayan expeditions of the mid 20th century, many of which were dominated by former soldiers. For example, John Hunt, leader of the successful 1953 Everest expedition, had spent some of the war as chief instructor at the Mountain Warfare School in Braemar before commanding a battalion on active service in Italy; he spoke later about his ‘military pragmatism’ as one of his main contributions (The Guardian, 9 November 1998) and his account of the expedition is heavily marked by that military experience, with its emphasis on efficiency and organisation, and also by imperial and nationalist sentiment, but with almost no mention of the beauty or sublimity of the mountain scenery. new snow had recently fallen on top of the already existing snow which had survived from the previous winter, and it so happened this this was easy to slip through, both because it was freshly fallen and so soft, and because it was not yet deep. But whenever they had trodden through it and set foot on the congealed snow underneath they no longer sunk into it, but slipped along with both feet, as happens to those who travel over ground coated with mud. But what followed on from this was even more difficult. For the men, being unable to pierce the layer of snow underneath, whenever they fell and tried to get a grip with their knees or hands in order to stand up, then they slipped all the more precisely because they were pressing down, the ground being exceptionally steep. (Polybius 3.55.1-4). The couloir up the rocks though steep was feasible. The sky was a deep sapphire blue. With a great effort we edged over to the right, avoiding the rocks. We preferred to keep to the snow on account of our crampons and it was not long before we set foot in the couloir…Fortunately the snow was hard, and by kicking steps we were able to manage, thanks to our crampons. A false move would have been fatal…A slight detour to the left, a few more steps—the summit ridge came gradually nearer—a few rocks to avoid. We dragged ourselves up. Of course this is different from the descriptions of Hannibal. Herzog’s account is intensely personal, full of anxiety and exhilaration. And yet Herzog’s moments of personal reminiscence are often overshadowed by painstaking descriptions of his engagement with the mountain terrain as a real, concrete presence, to be grappled with and overcome—in other words precisely the kind of language we have seen in Polybius. The prevalence of that material, stretching out before us for pages and pages on end, articulates the ambition and scale of the expedition Herzog is a part of. The quasi-military character of that expedition is also impossible to miss: the imagery of ‘assault’, ‘victory’, ‘conquest’ recurs over and over again. Take for example the first page of the preface, written by Lucien Devies, President of the ‘Comité de l’Himalaya’ and of the ‘Fédération Française de la Montagne’: ‘the conquest of Annapurna…With this victory…Victory in the Himalaya is a collective victory… the victory of the whole party was also, and above all, the victory of its leader’. Looking back on it now—I had never really noticed it before—I can see that my own early experience of mountains was a military one too. Like many English private-school students in the 1980s I had to spend one afternoon a week in my school cadet force. I managed to endure the hideousness of drill and boot polishing for a year and then escaped into the ‘Adventure Training’ section to do rock climbing and canoeing, but even there it was impossible to get away from the faint military hangover. Several times a year we were bused off to Wales and sent off to go and walk in the hills. I am grateful for it now, but I don’t think it was ever very pleasant. I suppose we must have admired the views sometimes, but I don’t remember it if so. In my memory it is always raining. Most of all I remember the kit: badly fitting army boots and old military rations. I remember coming down off one hill at the end of 16 hours of walking (having slept on the summit of Snowdon to get an early start): a fourteen-year old boy, trying not to cry, limping along behind the others with blisters the size of jam-jar lids on my feet. I would have sympathised with Hannibal and his men then. Maybe those ancient accounts of Greek and Roman armies are not so far away from types of mountain experience which still have a hold over us today. Illustrations: Front covers of John Hunt, The Ascent of Everest (2013 50th-anniversary edition; first published 1953) and Maurice Herzog, Annapurna (1997 edition; first published 1951) and Heinrich Leutemann, Die Karthager – Hannibals Übergang über die Alpen, 1866.